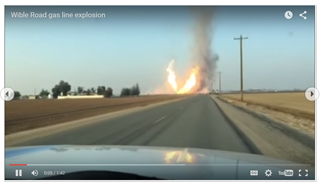 One person died and three others were sent to the hospital with second- and third-degree burns Friday afternoon after a natural gas line explosion sent flames hundreds of feet into the air near Houghton and Wible roads southwest of Bakersfield. Flames from the ruptured line could clearly be seen from the top of the City of Bakersfield’s 18th Street parking structure in downtown Bakersfield, at least 10 miles from the blast. Witness Marla Proffitt, who supplied dramatic video of the flames from the passenger seat of a pickup, said the fire was such that it “heated the interior of our truck, and the roar was louder than a jet engine. The push of gas and flames threw trees into the air, she said. The state’s primary regulator of natural gas lines, the California Public Utilities Commission, said it had sent an investigator to the site.